I'm a proud supporter of the PMC because it is leading a charge to beat cancer. In fact, last year 100% of rider-raised revenue went directly to support the Jimmy Fund and Dana-Farber Cancer Institute's tireless commitment to finding a cure. 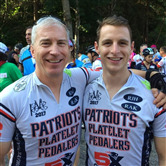 I will be riding for the Patriot Platlet Pedalers with both my dad and uncle for my second year and hope that you will support me in reaching my fundraising goal.